John Fetcher's ranching family leads the way in an effort to preserve open land through conservation easements in the rapidly growing Steamboat Springs area. Rancher John Fetcher recalls his years of ranching in the Elk River Valley and his mixed feelings about the Steamboat Springs Ski Area, which he helped start in the 1950s. 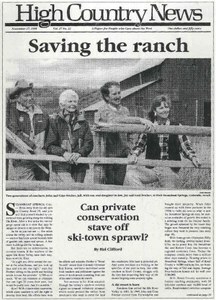 Ranchers fear the loss of their culture if they become tenants on land owned by wealthy people in places like Steamboat Springs. Staffer Jamie Williams talks about The Nature Conservancy's efforts to preserve land in Routt County, Colorado. In the effort to preserve Western open space, land trusts take the lead. A jury made mostly of hunters finds Chad McKittrick guilty in the death of a reintroduced wolf, and castigates his lack of "hunting ethics." Utah Rep. James Hansen's troubles; Yellowstone not crowded enough? ; Republicans' "green" image; Idaho potato festival; pedestrian conference in Boulder; Italian bees in Wyoming; Indians protest baseball team names. Federal shutdown, lions and bears, visitors. Ranchers win state grazing permits in New Mexico after eight of nine competing bids by environmentalists are rejected by the state. Descendants of Crazy Horse protest a Turner Network Television movie about the Lakota leader's life. The coal-fired Hayden Power Plant is found guilty of polluting the air of the nearby Mount Zirkel Wilderness area. A rare native fish, the Bonneville cutthroat trout, is discovered in Utah's Parley's Creek, and then accidentally poisoned by rotenone. Residents of New Mexico's North Valley object to the felling of old cottonwoods to make way for a bridge over the Rio Grande designed to ease Albuquerque commuter traffic. The Catholic Diocese of Pueblo, Colo., blasts the proposed Animas-La Plata water project as an "environmental, economic and social bungle." Several hunters die in shooting accidents in Colorado and Utah. The Colorado State Land Board raises opposition from ranchers, residents and environmentalists with its plan to sell part of the Yampa Valley's Emerald Mountain for development.